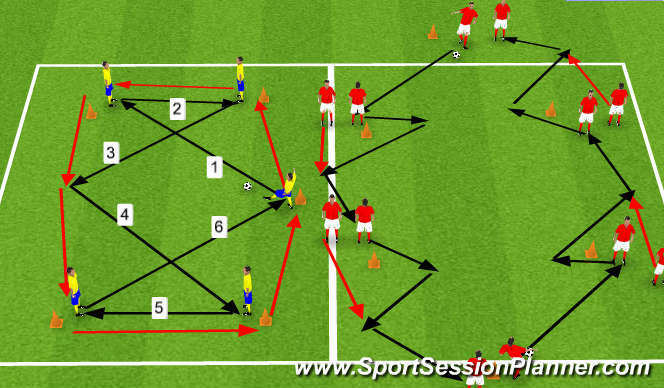 Quick passing movement focusing on weight of pass. 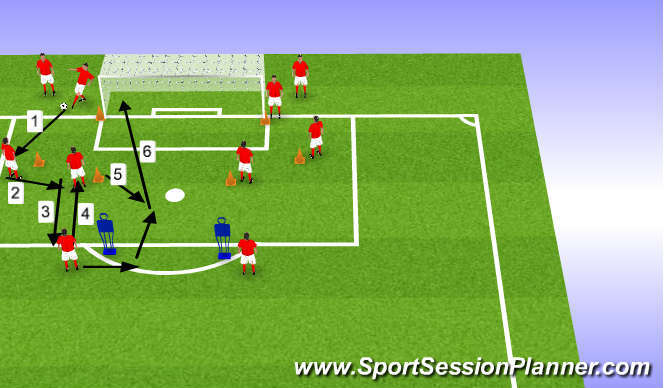 Overlap practice with two balls using the whole group. Players need to receive cut inside and then reverse pass to the overlap runner.Change direction and vary type of pass. 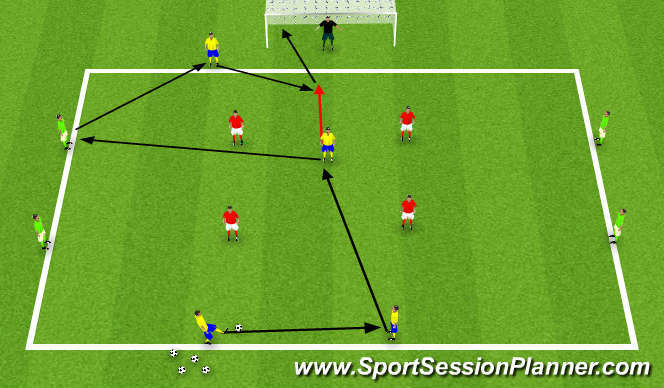 3 passes then into the striker who sets back and spis round the cone to receive a 1-2 and then shoots. Emphasise striking technique, rebounds and the moevemnt off the ball I.e. the spin to lose the defender. Vary combinations. Organisation: 3 groups of 4. Players organised into positions 4 defenders in the middle, player in the middle is the no.10.He plays off the two yellow centre mids and the forward player in front of the goal. The greens are organised as full backs and wide players. The no. 10 plays off all of these players and looks to score in the goal. If the yellows gain possession then the red has to win it back. Defensive team set up in a 4-2 (+keeper) formation and attacking team set up in a 1-2-3-1 formation.1 floating player.Defensive team score with a one touch finish in the two free goals. Coach defensive points throughout the game.